Clavel Architects led by Manuel Clavel Rojo, took on the renovation of the Casanueva Pharmacy in Murcia, Spain. (See before and after photos second row from top.) One of the major challenges of the project was that it had to be completed in two months and the store remained open during the first month. Because of this, 95% of the project was prefabricated. The amazing façade (who wouldn’t want a façade made of type? And one that lights up to boot!) not only spells out the store’s identity but serves as a shading mechanism from the hot afternoon sun. The façade and all the interior furnishings were prefabricated in a workshop, and the slat cladding was also a quick-to-build solution. I think Duane Reade with all their constant renovations would do well to pick up a pointer or two from Clavel’s cool redesign. 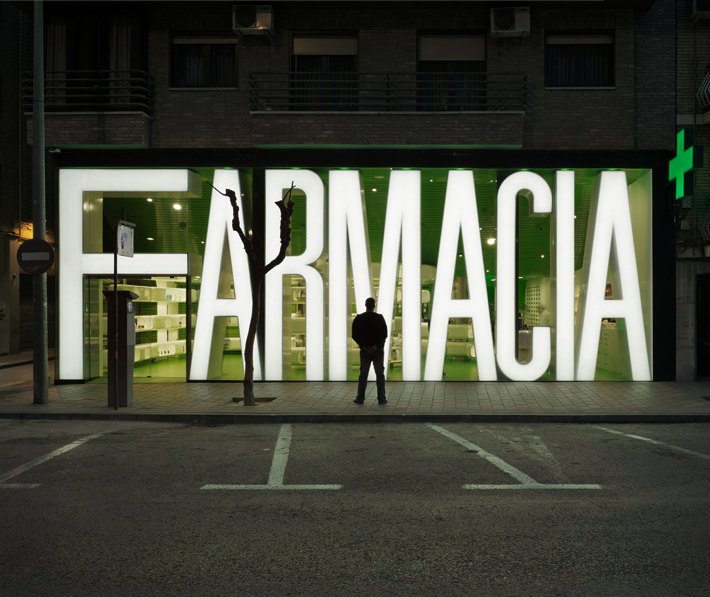 This entry was posted in Architecture, Industrial Design, Just Plain Cool, Stuff We Like, Typography. Bookmark the permalink. Very cool. Do you think they sell real medications? Sure, why not? They’ve got the little green cross sign outside. Sorry Dare, I don’t know. It’s likely that if you contact the architect (Manuel Clavel) he would answer that for you. You can click through to his site through the post and there’s a contact button there. Good luck! Hi Collacubed! Im Manuel Clavel. Ana and Pablo told me about this great blog. Thanks fot the post and congratulations for the wonderful phone case design. It´s amazing. See you soon! Hola Manuel! Your comments were in the spam folder, so I didn’t see them until now. Thanks for the kind words and for stopping by the blog. As you know, we are a fan of your work!